Geometric distortion and differences in color shades between stereo frames are common problems for automatic stereo processing, such as stereo-to-multiview conversion. These artifacts greatly decrease the subjective visual quality of resulting stereo video. These factors can cause you lots of trouble when you’re processing stereo video, and they decrease visual quality. High-quality stereo must contain only horizontal parallax, and it must have the same object color for both views. Furthermore, viewers watching mismatched stereo content may suffer deleterious effects like headaches or negative emotions. The YUVsoft Stereo Correction plugin for Adobe After Effects was specifically designed to correct such common problems. The Correct geometry mode fixes tilt and shift between left and right views in your source video. The Correct color mode adjusts color shades between stereo views. These two modes can be enabled simultaneously for optimum results. 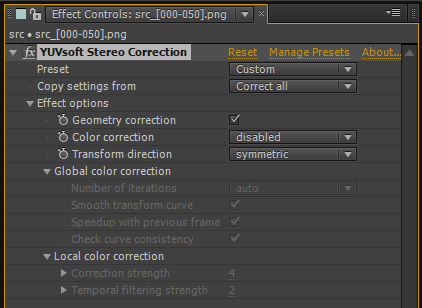 The YUVsoft Stereo Correction plugin for Adobe After Effects uses a side-by-side stereo pair sequence as input. 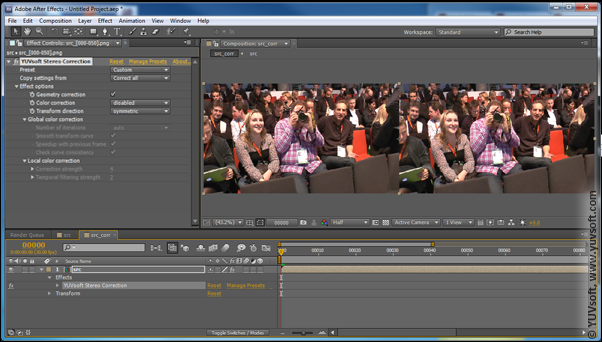 You then receive the corrected stereo pair video in the same format.